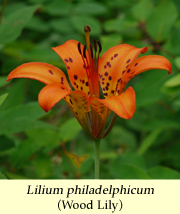 The Philadelphia Botanical Club, founded in 1891, is dedicated to increasing knowledge and appreciation of the botany of the Philadelphia region and beyond. Meetings featuring talks by botanical experts. Meetings are held monthly from September through May. Field trips to wild areas and gardens in Pennsylvania, New Jersey, and Delaware — and occasionally farther afield. Field trips have two purposes: to record the plant species at the field trip site and to increase participants' knowledge of plants. Workshops on botanical topics, such as fern identification and grass identification. Bartonia, a journal of botany, which we publish annually. Bartonia was named for William P. C. Barton, author of the first local flora of Philadelphia (1818). Awarding grants, including the Bayard Long Award for students conducting botanical research and the Philadelphia Botanical Club Grant for club members engaged in botanical research, education, or conservation. Supporting the herbarium at the Academy of Natural Sciences of Drexel University. We encourage anyone with an interest in plants to join. Membership includes a subscription to Bartonia. To join us, visit our membership page. Updated January 2, 2016. Rhus typhina and Lilium philadelphicum images © 2003 Janet Novak. Web site hosted by The Academy of Natural Sciences.